Hurricane Irma certainly wreaked havoc throughout Florida. Few if any community associations in the state escaped the wrath of this storm. Photos and videos of flooded golf courses, homes, and building lobbies are still fresh in our minds as many associations continue to rebound from this storm. And while the repair is certainly underway, associations still have quite a bit of work to do, especially for the homes and buildings that line canals, lakes, rivers, and oceans. As we survey the damage, our major message to associations is to repair shorelines as quickly as possible and to assume that another storm like Irma will hit in the future. One of the major effects of this storm was the loss of land along waterways. Fluctuating shorelines and collapse of land is inevitable, but the process is severely increased with a major storm. We have seen homes fall into canals due to encroaching water. Land has collapsed along association green spaces and golf courses, causing dangerous conditions. There have been serious injuries resulting from riding mowers tipping due to unstable land. Residents avoid walking along the shorelines for fear of injury. Also, electrical and internet cables are exposed, resulting in costly repairs. Erosion and fluctuating water levels de-stabilize the land. Unstable land can be hazardous—golfers walking along the shore could fall, causing injury. Golf cart accidents are typical. In addition, these conditions are hazardous for landscapers and lake management firms since heavy equipment frequently rolls over. Deaths and injuries have occurred. Those living on lakefront properties frequently avoid taking advantage of their backyard amenity due to dangerous conditions. Fluctuating water levels become a haven for burrowing animals (otters, fish, iguanas), which also create these unstable shorelines. Eroding shorelines leave drainage pipes, sprinkler systems, and electrical, cable, and Internet lines exposed and subject to erosion and costly repairs. It’s not unusual to see water actually encroaching on homes, threatening flooding. As shorelines continue to erode, many associations are turning to the SOX solution, which involves installing our knitted mesh along the eroded shorelines. Once installed, the mesh is pumped full of locally-sourced dirt, compost material, and/or dredged sediment. It is then anchored with a sub-surface finish. The banks are planted with sod, landscaping, and other desired vegetation, which quickly take root through the mesh. The result is a stable, long-lasting shoreline, which adds aesthetic value to the property, improves the natural ecosystem, and eliminates safety risks for workers, residents, and maintenance staff. The new SOX “living shoreline” is expected to last several decades. The other major benefit is that the mesh system also filters chemicals from run-off, preventing pollution to waterways. It is much more effective and efficient than other solutions, such as seawalls and geo-tube products. Within days of installation, residents of community associations have a safe place to stroll and don’t have to worry about falling on collapsed land. The threat of flooding is also eliminated. Many associations throughout Florida are turning to this alternative, as shown by the following examples. Welcoming back the manatees: One small association on Florida’s Treasure Coast was at peril immediately following Hurricane Irma. Canal waters were encroaching on homes, presenting a real threat of flooding. Several homes were on the verge of falling into the canals. The shorelines were unsightly. In addition, the county commission recently voted to prohibit the installation of cement seawalls because they don’t prevent runoff of chemicals into the canals and are not aesthetically pleasing. Residents continually expressed interest in finding a solution that naturally restored the shoreline with landscaping while preventing future erosion. Residents also noticed that manatees and other wildlife were avoiding these canals due to the pollution. This association turned to the SOX technology, and within a matter of days, the shorelines were restored and today provide a filter that prevents chemicals and nitrates from seeping into the canals. The results? Homes are safe from flooding. People are enjoying their waterfront properties again. And, the manatees have returned. 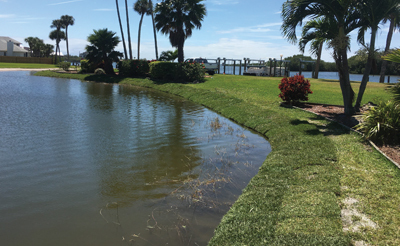 Destroyed seawalls, reinforced: Another southwest Florida community, while not being able to avoid the re-construction of seawalls, turned to the SOX solution to provide a quick repair and a secondary line of defense against erosion caused by fluctuating water levels. This community, with most of the homes backing up to a network of canals, faced potentially catastrophic flooding in the immediate aftermath of Hurricane Irma. Seawalls cracked, crumbled, and fell into the canals, leaving homes defenseless. In this case, the seawalls will eventually be re-built due to the association’s desire to have a uniform look along the canals. However, in the meantime, the SOX products have been installed directly behind the seawalls, providing immediate protection until the more complex and expensive construction of seawalls can be built. The SOX products actually provide a second line of defense from flooding. 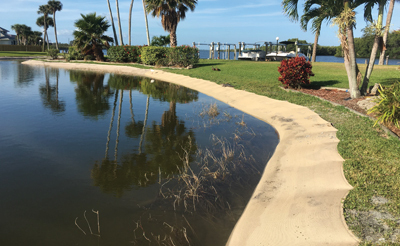 Newly sodded and restored shorelines serve as a filter, preventing excess phosphates and nitrates from entering the waterways. This, in turn, provides better habitats for fish and wildlife. From an aesthetic standpoint, these waterways are now able to sustain vibrant, native plant life, which provides a better view than collapsed land filled with mud and algae. Once installed, these products actually save municipalities, associations, and golf courses significant money because they are permanent solutions. This product can be “re-tensioned” whenever necessary to achieve desired slope. Community associations with waterfront property have great value. But if this value is to be maintained, directors should accept the inevitability of shoreline erosion. Property management firms and directors are advised to maintain these shorelines with the same care and vigilance that is exercised with clubhouses, golf courses, and other amenities. Brian Fischer is president of Boca Raton-based SOX™ LLC Erosion Solutions. 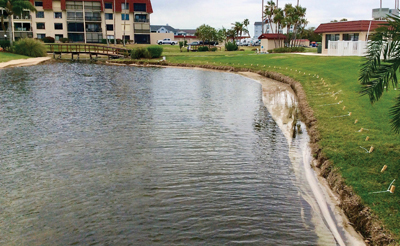 The firm has mastered erosion control and restoration of living shorelines and hillsides with its suite of patented, bioengineered erosion control solutions that are stable, long-lasting, and compliant with all BMPs (Best Management Practices). For more information, visit www.SOXerosion.com.